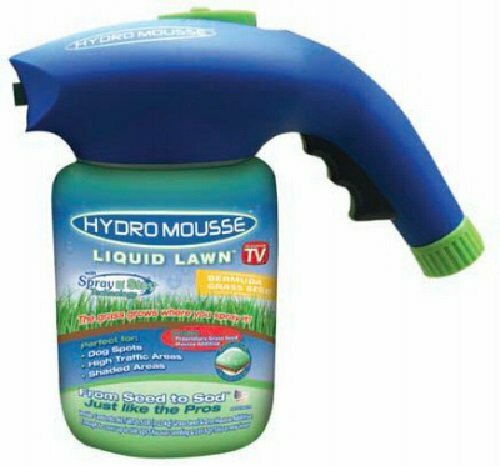 As seen on TV, Hydro mousse liquid lawn Bermuda kit, incudes 2 oz mousse Pod & 1/2 lb of seed, grass grows where you spray it from seed to sod like the pros, over seeding, Dog spots, shaded & high traffic areas, 1/2 lb seed coverage areaup to 500 soft. As seen on TV, Hydro mousse liquid lawn Bermuda kit, incudes 2 oz mousse Pod & 1/2 lb of seed. Grass grows where you spray it from seed to sod like the pros, over seeding, dog spots. Shaded & high traffic areas, 1/2 lb seed coverage area up to 500 sqft. If you have any questions about this product by Eagle Eye Marketing Group, contact us by completing and submitting the form below. If you are looking for a specif part number, please include it with your message.